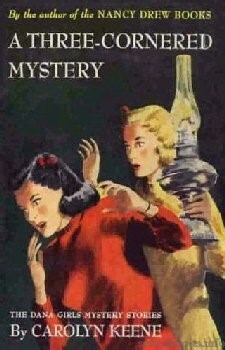 The Dana Girls is a series of juvenile mystery novels produced sporadically by the Stratemeyer Syndicate and published by Grosset & Dunlap between 1934 and 1972. 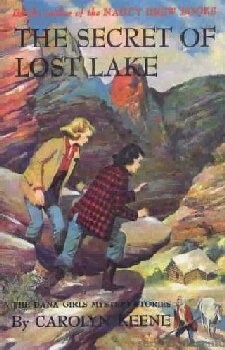 Leslie McFarlane (author of the early Hardy Boys books) authored volumes 1-4. 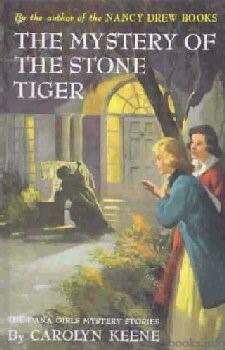 Mildred Wirt Benson (author of the early Nancy Drew books) wrote volumes 5-12 and 14-16. The remaining volumes, including the new ones (14-17) in the revised editions, were authored by Harriet S. Adams who is believed to have created the series and written the original plot outlines. Brunette Louise Dana, 17, and her blond sister Jean, 16, are orphans who reside in the pleasant town of Oak Falls with their uncle, Captain Ned Dana, his spinster sister, Harriet Dana and his clumsy housekeeper, Cora Appel. Both the Girls are sophomores at the exclusive Starhurst private girls school in the nearby village of Penfield, where they seem to be unable to restrain themselves from excelling at everything. Not unnaturally, this attracts attracts some ill feelings, particularly from the unpopular Lettie Briggs and her sycophantic crony, Ina Mason, who dog them throughout virtually every story. When not busy being excused from classes to go solve their little mysteries by stern headmistress Mrs. Crandall, the Girls find the time for an occasional platonic date with Ken Scott and Chris Barton, a couple of interchangable nonentities from the nearby Walton Academy. In 2010, The Dana Girls made their first ever appearance in comics when they guest starred in Papercutz's Nancy Drew Girl Detective Graphic Novel #20 & 21, which was also the first ever crossover between Nancy Drew and The Dana Girls. 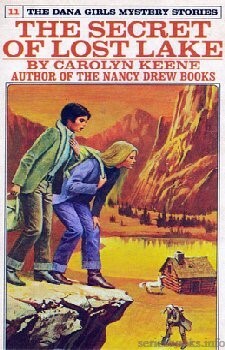 In 2017, they appeared again in the Nancy Drew Diaries Graphic Novel #10. 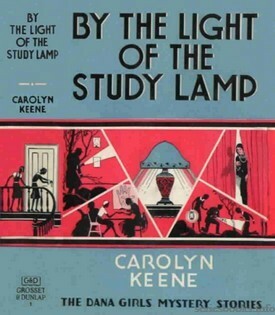 Jean and Louise Dana are given a valuable study lamp by their Uncle Ned. The girls plan to place it in their study room at Starhurst when they return for their sophomore year. 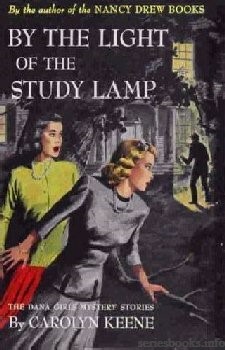 But before the girls leave, the lamp is stolen! After the sisters return to Starhurst, they discover the lamp in a secondhand shop and buy it back. Unwittingly, the girls make an enemy of their classmate, Lettie Briggs, not only because the girl had planned to buy the lamp but because the Danas' room is the one Lettie wanted to have at Starhurst. The Danas are overjoyed when they discover that their friend Evelyn Starr has returned to Starhurst. Evelyn's family once owned Starhurst, but Evelyn and her brother now have very little money, and Evelyn is unsure that she can pay for the tuition. 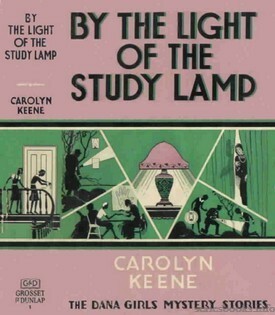 The Danas hope that they can find a way to help Evelyn stay at Starhurst, little realizing that the solution to Evelyn's problem is held within the antique study lamp. Miss Tisdale, Jean and Louise Dana's favorite teacher, disappears mysteriously one afternoon. The Danas search for clues and discover her car abandoned on a nearby road. The key is still in the ignition, and there are signs of a struggle. Miss Tisdale has been abducted! 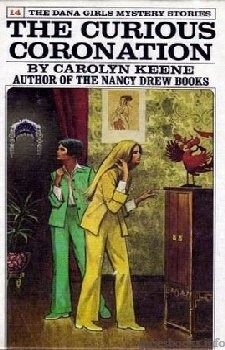 Jean and Louise learn that Miss Tisdale has been supporting her widowed twin sister, who has been disowned by their parents ever since she married. 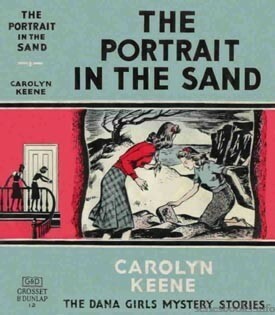 Mrs. Brixton is being threatened by her husband's former partner, and the Danas suspect that this man is responsible for Miss Tisdale's strange disappearance. The police cannot be contacted, because Miss Tisdale's father is in frail health and the shock of her disappearance could kill him. The Danas seek Uncle Ned Dana's help in tracking down Miss Tisdale, and the three Danas undertake their difficult mission without assistance. "It's all the money I have in the world—" The pathetic hunchback, Josy Sykes, despairs as a fox runs off with her one thousand dollar bill. Louise and Jean help the lonely orphan by having her first come to Starhurst and then to a friend's during Christmas vacation. Josy's luck changes when a hunter finds her one thousand dollar bill, but when the hunter accidentally humiliates Josy because of her deformity, she runs away. The hunter also runs away, upsetting his employer, Miss Melbourne, and the Dana girls' friend, Miss Marsh, who is in love with him. The Dana girls are puzzled at this strange turn of events. Louise and Jean Dana's new friend, Edith Darrow, invites them to stay at her home for the weekend. 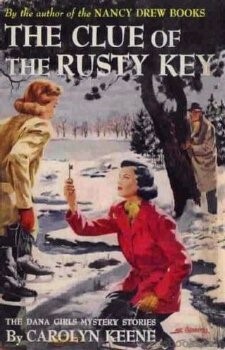 While the girls are touring the property, they discover a hidden stash of objects in the barn which appear to be linked to Ed Carillo, a man wanted for swindling a real estate agent. Louise and Jean spend the night in the barn, hoping to discover who left the items in the barn. During their vigil, an injured man stumbles into the barn. 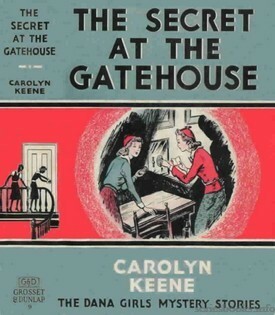 The girls go to the main house for help and discover that Edith has disappeared and the house has been ransacked! What could have happened? 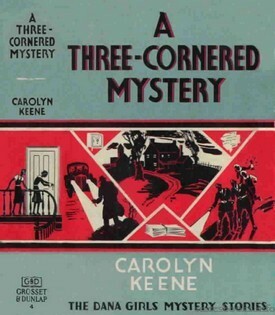 The mystery takes several more strange turns when the girls meet another person swindled by Carillo and then meet Carillo's mother, a nice person who is unaware that her son is a swindler. The girls work diligently on their complicated mystery, hoping to find Carillo, help the injured man, restore the stolen property to the rightful owners, and spare Mrs. Carillo the hurtful truth about her son. Delusional Harold Norton, ex-warden of the Pinecrest Reformatory, accuses Louise Dana of being escapee Nina Regan. Louise clears herself, only to find that Norton continues to stalk her every move. 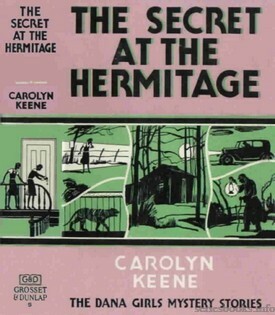 After Louise is attacked by Norton, she is lost in the woods and spends the night with a strange hermit. Upon Louise's return to Starhurst, she becomes intrigued with Nina's strange case. Nina was never proved guilty of her crime, so Louise wants to help her. The girls discover that the old hermit may know where Nina is hiding. Meanwhile, Harold Norton relentlessly hunts for Nina, endangering both Louise and the old hermit. Louise and Jean must quickly discover Nina's whereabouts and learn whether she is guilty. The Dana girls are plunged into another mystery when they befriend the Doke family shortly after Mason Doke unfortunately crashes into their uncle's ship with his airplane. 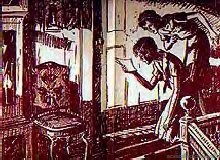 The Danas interrupt a burglary at the Doke home and discover that the would-be thief was attempting to steal a box full of money. Mrs. Doke fears greatly that the money was stolen by her husband, and the Danas assume responsibility for the money until Mrs. Doke can decide what to do with the money. 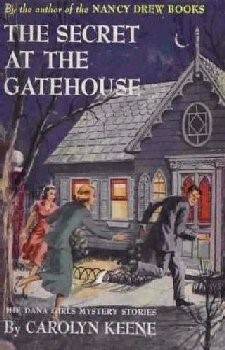 The thief learns from Lettie Briggs that the girls live at the Starhurst school, and the girls are forced to move the money several times in order to prevent a theft. 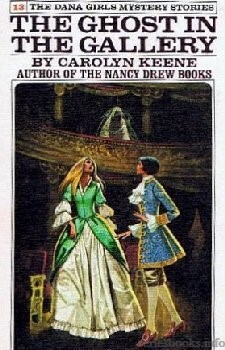 Mr. Doke dies of his injuries, and Mrs. Doke requests that the girls help her discover the rightful owners of the money so that she can right the wrongs of her husband. The Danas face many harrowing adventures as they search for the owners and narrowly escape being poisoned by an insane woman. The students are Starhurst are excited about Mrs. Crandall's plans to purchase a piece of property at Moon Lake for a girls' camp. Five girls, including Louise and Jean Dana, earn the privilege of accompanying Mrs. Crandall to the proposed site on a weekend outing. Much to the Danas' dismay, Lettie Briggs makes the trip as well since Mrs. Crandall has promised her parents to look after Lettie while they are away. The trip proves to be exciting, because the house located on the proposed camp property appears to be haunted. At any rate, someone else is staying in the house inside the locked attic room and only comes out at night when the Starhurst group is asleep. 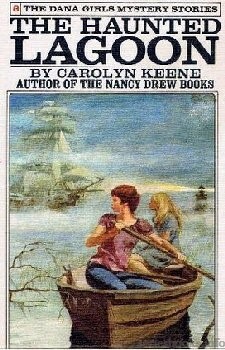 Louise and Jean help Captain Dana find Katherine Blore, a woman who disappeared mysteriously from his ship before it docked. The Danas trace Miss Blore to her current residence, but she refuses to see them. 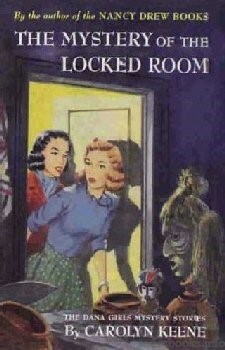 The Danas try once again to see Miss Blore but find her home empty except for the landlord, who is locked in a closet. The landlord, Mr. Wharton, has suffered a heart attack, so Louise and Jean help him get the house rented by showing it to prospective tenants. While in the house, Louise falls strangely unconscious and remains asleep for 12 hours. Later, the same fate befalls Mr. Wharton and one of the new tenants. Louise begins researching herbs, thinking that a poisonous herb may be the culprit for the sleeping illness. 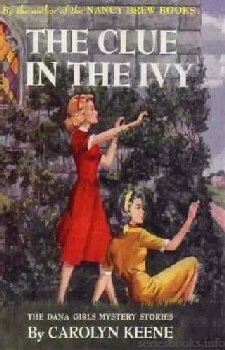 The girls divide their time between searching for the mysterious herb and searching for Miss Blore, who has left the state. 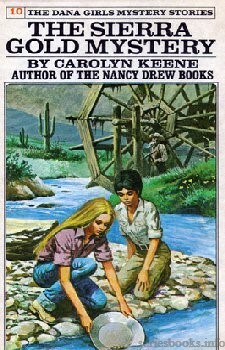 The girls must travel to a distant ranch and back home again before they can solve the mystery. Louise and Jean become enmeshed in another mystery when they chance to meet Mrs. Zerbe, who used to work for Mr. Warrington, one of the owners of Captain Dana's ship. Mrs. Zerbe is devastated that she lost her job at Mr. Warrington's estate. During her conversation with the Danas, Mrs. Zerbe mentions a secret which she has kept for Mr. Warrington. The girls are intrigued but refrain from prying into Mrs. Zerbe's affairs. Later, they are to recall the conversation when Mr. Warrington tries to discover whether Mrs. Zerbe revealed any personal information to them. 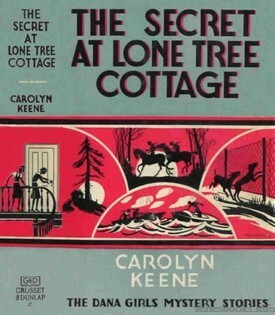 The mystery deepens when Mrs. Zerbe dies of a heart attack, Mr. Warrington's valet, Nat Kaner, tries to steal Mrs. Zerbe's belongings, and Mr. Warrington vanishes. The girls are left with a complex mystery to solve which has an astonishing solution. Jean and Louise are excited to be spending Christmas vacation at Highfort, a property that Captain Dana's friend Tom Fairweather is in the processing of purchasing. The Danas' trip turns out much more exciting than anticipated, because several other people show up at Highfort claiming ownership to the property including arrogant Mrs. Plimpton and the Danas' school friend Sonya Olavu and her brother Tranley. Mr. Fairweather disappears before his arrival at Highfort, further complicating the situation. The Danas feel loyal to Mr. Fairweather, but he cannot defend his claim to the property. The situation becomes more grim with the disappearance of Sonya's jeweled star and a mysterious nighttime visitor who wrecks the Christmas tree. The Danas must solve the mystery but are at a loss to know how to begin. The Danas are thrust into the middle of a dispute between Oliver Pritz Gormly and Jasper Conway. 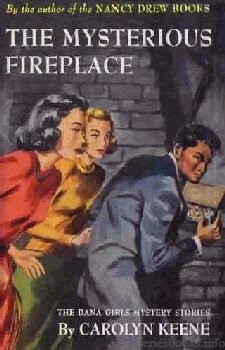 The girls rescue Conway and his important papers when Gormly sets fire to Conway's store. 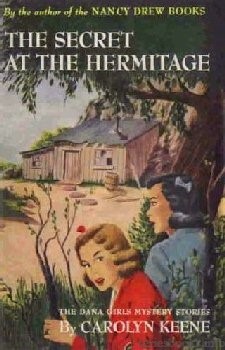 Later, when Pritz confronts the girls and orders them to turn over the papers, the girls refuse, earning themselves a new enemy. 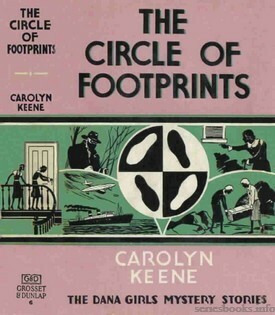 Jean and Louise learn that Gormly is a swindler, cheating many people, including their classmate Lettie Briggs, who refuses to believe that Gormly is dishonest. 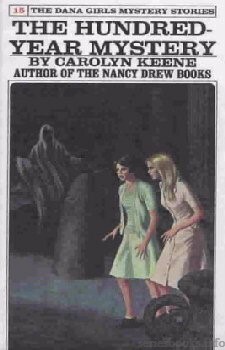 Jean and Louise can do little to help Lettie since she refuses to talk to the Danas, but the girls befriend several other victims as they search for clues. The girls face many difficulties before they finally bring Dr. Gormly to justice. 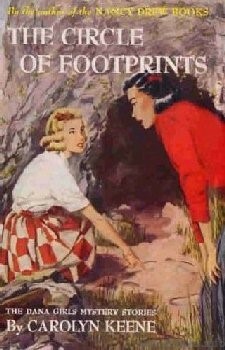 The Danas' pottery teacher, Miss Warren, asks Jean and Louise to help her find her missing fiancé, F.B.I. agent Richard Henley. 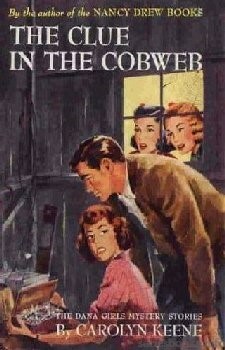 The girls and Miss Warren stay with her aunt and uncle, the Pattons, while they work on the mystery. The Pattons fear that Henley has drowned, since his boat has washed up on shore. 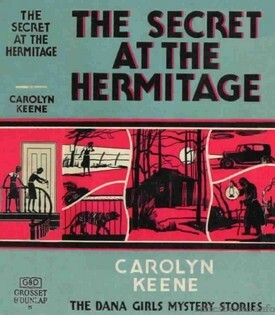 The Danas find few clues but wonder if the strange hermit, Ham Gert knows anything about Henley. 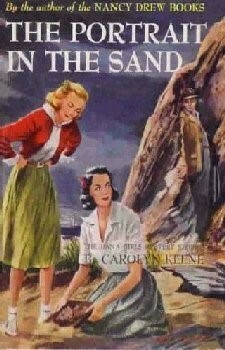 Gert refuses to talk except to warn the girls away from the cliff and the beach. 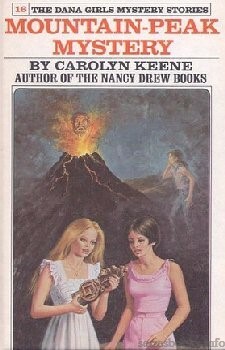 The girls become suspicious of Gert and wonder about the strange cries they hear coming from the top of the cliff. When the girls investigate, the cliff is deserted. The mystery proves difficult to solve, especially when Lettie Briggs appears on the scene and thwarts the Danas' investigation. How the Danas discover what happened to Richard Henley and help the government will thrill the reader from start to finish. 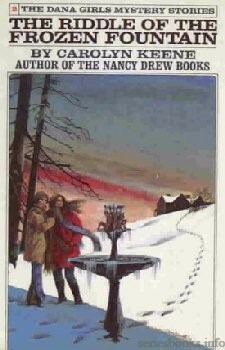 When Arlene Sherwood disappears, the Danas' only clue is that Arlene received a dire prediction from a psychic reader. Did Arlene run away out of fear caused by the prediction, or is something far more sinister at play? Jean and Louise believe that Arlene has been abducted, especially after they learn that Arlene's father has also disappeared. 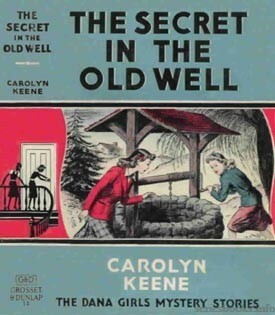 Mrs. Sherwood soon receives a message from her husband, requesting that she place certain important drawings in an old well. The drawings are very valuable to Mr. Sherwood's work, and the loss of the drawings will be a great blow. 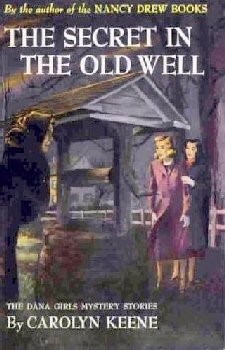 Louise and Jean travel to Old Bridge to spend the weekend with their friend, Carol Humfrey. 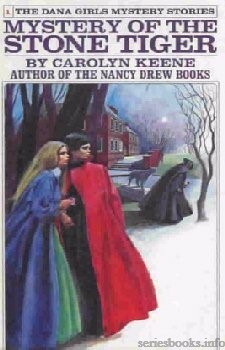 The girls stumble upon a mystery when the bell inside the Webster College chapel rings mysteriously at night. They visit the chapel, only to be warned away by gossipy Miss Weatherspoon. 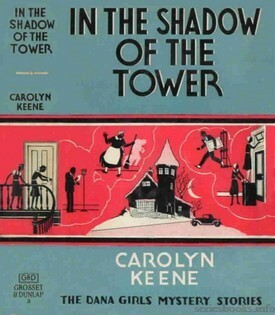 Miss Weatherspoon claims that the bell tower is haunted by the ghost of a young child who died of starvation while locked inside the bell tower. She also hints that the ivy covering the church hides a great secret. 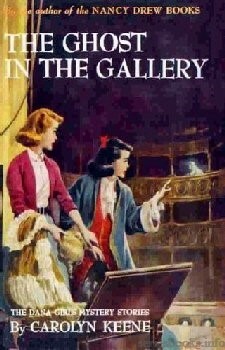 The girls are intrigued, especially after they learn from Mr. Humfrey that the chapel reputedly holds a clue to a hidden treasure intended for the perpetual upkeep of the chapel. Louise and Jean feel certain that the recent mysterious events mean that someone is searching for the treasure and resolve to find it before that person is successful. Fleurette Garnier, a new student to Starhurst, puzzles Jean and Louise. The new French girl is reclusive and reluctant to join the new archery team, even though she is an expert archer. 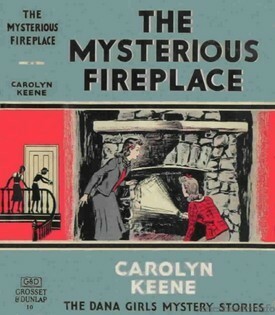 The mystery surrounding Fleurette deepens when Fleurette briefly disappears, and her room is ransacked. Jean's jade ring, a precious heirloom, is stolen shortly before Fleurette arrives at the school and appears later at a pawn shop. 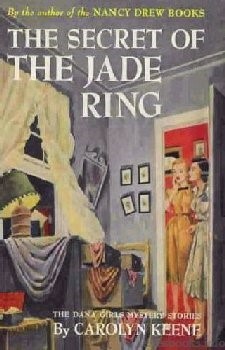 The school's museum houses an imitation of a valuable jade ring which is also stolen. Fleurette becomes flustered whenever these incidents are discussed, drawing suspicion to her. Although Jean and Louise believe that Fleurette may know something, they feel that the girl is honest. Fleurette refuses to talk, and the Danas hope that they can solve the mystery before something terrible happens to Fleurette. The Dana girls are plunged into another mystery during a visit to an old Civil War inn on a lonely country road. They hear singing in the woods, see a ghost, and discover a strange spoon with a handle in the shape of a man's head. The girls are shocked to learn from a jeweler that the spoon is cursed. The girls visit the old inn again and meet Nura, a young gypsy who has run away to avoid marrying a man whom she does not love. Nura instead longs to marry Stivo, but Stivo has been banished from the gypsy tribe for stealing a valuable silver platter. Back at school, the spoon disappears from the Danas' room, apparently stolen! Now the girls must find the spoon in case the story of the curse is true and must help Nura by exonerating Stivo and discovering who stole the silver platter. A ghostly figure, a walking suit of armor, and a gargoyle in the prompter's box confront Jean and Louise Dana and their Starhurst classmates as they rehearse for a musical at Mozart Hall. The owner, a retired singer, and the watchman assure the performers there is nothing to worry about. The students wonder whether their imaginations are playing tricks on them. Or are spooky things actually happening each time they visit the opera house? A contest is held for an original song to be used in the play. The Danas' music is stolen but they make a copy and submit it. When their song is chosen as one of the winners, a listener says she has heard it before! Louise and Jean face danger and intrigue, but they work hard to solve several mysteries and to win out over their enemies. "You will sell me the flower!" insists the strange man. 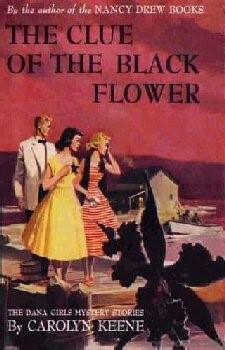 Louise Dana is baffled as to why the man would value an artificial black orchid. Shortly after Jean and Louise arrive at summer camp, the orchid is stolen. The girls learn that not only does the orchid have a hidden value, but may provide a clue to a pair of twins who went missing years before in South America. Through a series of amazing events, Jean and Louise learn what happened to the missing twins and discover the secret of the black orchid. "Save Carlo . . . winking ruby . . . hurry!" This plea uttered by Gino, a mysterious violinist, just before he lapses into a coma, launch Jean and Louise Dana on their first exciting adventure in Europe. 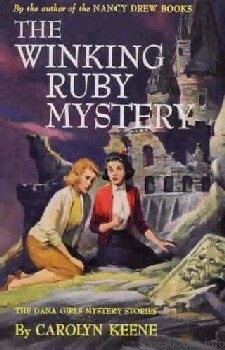 Is the mysterious "ruby" a gem, a girl, or part of a secret code?" The Danas must find out—and fast—because a life is at stake. Danger stalks the young detectives from the moment they board the Balaska with their Uncle Ned, captain of the ocean liner. Crossing the Atlantic they meet Enrico and Lena Dotti, professional hypnotists, who offer to help in solving the puzzle. Jean wants to accept, but Louise is suspicious of the Dottis. In Europe, the sisters discover that Gino's family has disappeared, driven into hiding by blackmail and threats of mal occhio, the evil eye. Probing deeper into the strange riddle, Jean and Louise become enmeshed in a mystery more frightening than the dungeon in which they are imprisoned. How they extricate themselves and locate a fabulous crimson gem make a pulse-quickening story. Handsome Prince Rudolph Krisler's request for help in finding his family's long-lost heirlooms launch Jean and Louise Dana on another exciting mystery while on vacation in Europe. 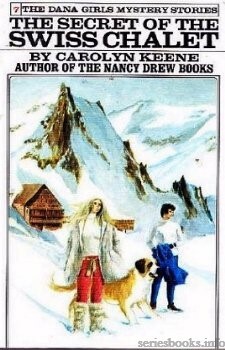 The search for the priceless heirlooms leads from Germany to glorious Switzerland, where the girls and their traveling companions are swept up in adventure and intrigue more dangerous than a thundering avalanche. First, their quest is hampered by a mysterious young man who claims to be a member of the Krisler family. Next, a strange accident nearly costs Louise her life. 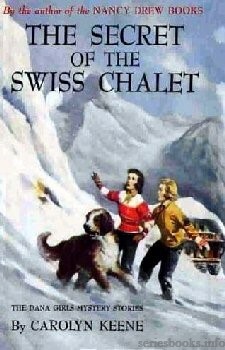 Thoroughly mystified but equally determined to unmask their enemies, the girls follow a baffling trail of clues which finally leads them to an abandoned chalet in the Swiss Alps. A trip to the St. Bernard Hospice, a perilous snowslide, a whirlwind escape on skis—all play an exciting part in unlocking the dangerous mystery. "Impossible!" the girls gasped. 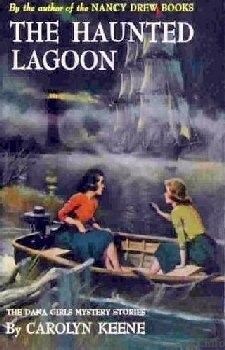 Louise and Jean Dana stare unbelievingly through the swirling mists in an isolated lagoon. In mid-air floats a fantastic apparition—a full-rigged sailing ship! The next moment, the phantomlike vessel dissolves in the fog. Never before have the Dana sisters encountered so strange and eerie a situation. Little did they dream, when invited to visit fascinating Chincoteague Island off the Virginia coast, where wild ponies roam, that their carefree vacation would turn into a challenging and exciting mystery. To find the solution, Louise and Jean must uncover the whereabouts of an ex-sea captain, Tracy Forsythe, whose once proud career was ruined under tragic circumstances during a shipwreck years ago. In their efforts to locate the missing man and help the captain's heartbroken family clear his name, the two young sleuths are thwarted constantly by a sinister enemy who resorts to desperate measures to prevent them from unearthing the truth. Readers will share many thrilling, spine-tingling moments with the Danas as the girls pursue the baffling trail of clues that leads them to pirate treasure and a startling climax. 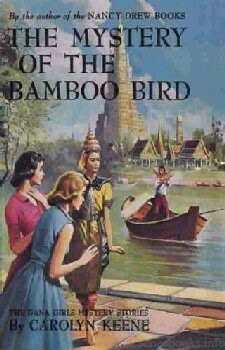 When a precious gilded bamboo Garuda bird, containing a sacred golden statue studded with jewels, is stolen, the lovely Malee Wongsuwan begs her school friends, Louise and Jean Dana, to help recover the treasured bird, a gift from her father. Despite Malee's warning of possible danger, the Danas agree to take the case, never dreaming that in a few days they will be pursuing their search in the Oriental splendor of Malee's native land, exotic Thailand. 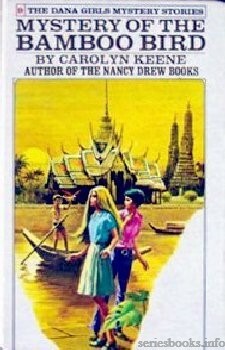 Via romantic Honolulu and fascinating Tokyo, the three girls fly to Bangkok, spectacular shimmering capital of Thailand, where a mosaic of clues and harrowing experiences await the young detectives. Along the picturesque canals, or klongs, once the chief thoroughfares of the "Venice of the East," where the lighthearted, gentle people still ply their trade from boat to boat, Louise and Jean put their sleuthing ability to its greatest test. Clues discovered during a breathtaking boat chase through the floating market and a visit to the golden Temple of the Dawn lead to the capture of an elusive international jewel thief. Louise and Jean Dana fly home from Thailand completely unaware of the exciting adventures waiting for them just a few hours away. 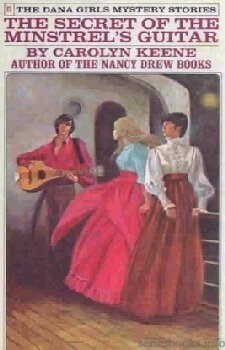 But even before their plane lands in San Francisco, Louise's precious star sapphire ring is stolen, and the girls are plunged into a new mystery. Before the Danas have a chance to investigate it, a fellow traveler, Janet Crane, begs them to find her grandfather who has disappeared somewhere in the rugged terrain of the Sierra Nevada mountain range in eastern California. 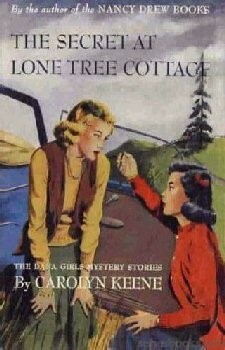 The two mysteries must wait, for the girls have promised to visit their aunt, Mrs. Carol Reed, in Sacramento. 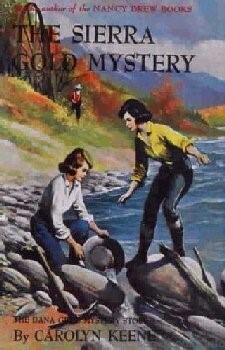 Aunt Carol tells Louise and Jean a family secret about a chest of gold nuggets which was buried for an ancestor during the historic gold rush of 1849 by his devoted Chinese servant—and now the girls have three thrilling mysteries to satisfy their love of adventure. Four generations of Reeds have searched for clues to the treasure with only a half-charred letter to guide them. Now Jean and Louise, with their sharp instinct for solving the most complicated riddles, decide to add their three mysteries together—and come up with a triple solution. In the Rocky Mountains, a witch is reputedly haunting the area where an isolated community was buried by a landslide forty years ago. 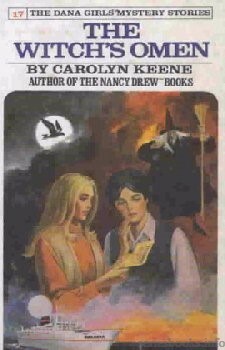 Jean and Louise, searching on horseback for a runaway show dog, try to fathom the mystery of the witch. A nefarious plot against the weird figure manifests itself in bizarre clues: a threat chipped in the stone wall of an ancient Indian cave and a message - "Get the witch!" sinisterly triple-echoed in a rugged canyon. Who is this woman? Why does she frequent the site of the old disaster? Most important of all, who are the evil enemies pursuing her - and why? A black-robed ghost roams the streets of the Danas' home town. A tiger stalks the woods on the outskirts of Oak Falls. And the Hilary Museum is plagued by a phantom prowler who seemingly passes through locked doors and windows. Louise and Jean Dana, returning home from a long trip, are horrified by these events. 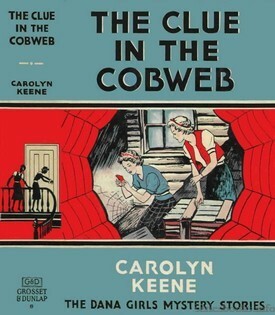 Their friend Elise Hilary begs them to solve the mystery surrounding the private museum. Elise, however, can volunteer no clue to what the ghostlike intruder is searching for, nor can she offer any clue to the sender of a threatening note. Center of the sinister conspiracy is the magnificent marble tiger presented to the museum by a maharajah. Its eyes glow by night, the black-robed ghost attempts to mutilate it, and the sound of flute music floats eerily from somewhere in the museum. Determined to unravel the spooky puzzle, Louise and Jean involve themselves in some frightening adventures as they follow a maze of clues to the solution of this suspense-filled mystery. 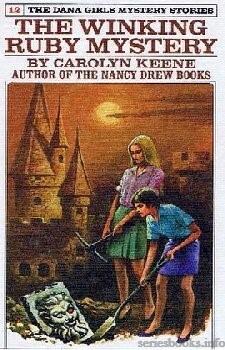 Louise and Jean Dana return to Starhurst School, which has been rebuilt after the fire described in an earlier adventure. 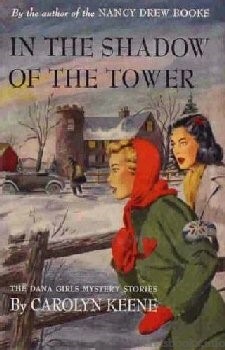 As usual, the two lively sisters are eager to tackle a baffling mystery which suddenly turns up. 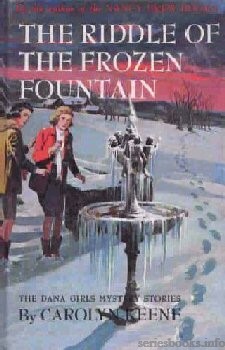 It all starts when Professor Crandall receives an anonymous note warning him not to remove the valuable Cellini bronze fountain that he has just purchased from the old Price estate. While tracking down the writer of the threatening note, Louise and Jean courageously face danger as they become more and more deeply enmeshed in a puzzling chain of events. 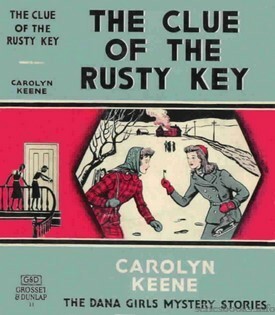 A strange blond woman, phantom ice skaters, a mysterious riddle, and a terrifying gorilla-man are only a few of the clues that challenge the girls' detective skills. 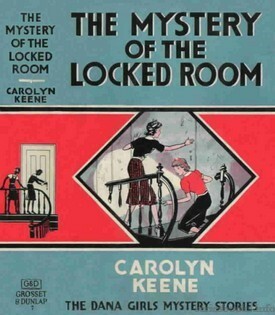 How Louise and Jean solve the mystery, and finally see the beautiful fountain safely installed on the Starhurst School campus, makes a fast-moving Carolyn Keene mystery, packed with surprising happenings and breath-taking suspense. 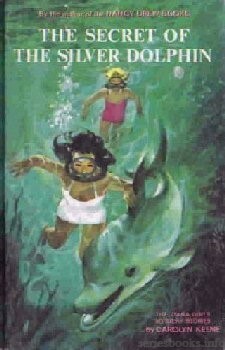 A radio newscast announcing a reward to anyone who can locate a valuable silver dolphin involves Louise and Jean Dana, teen-age sister sleuths, in a baffling search. 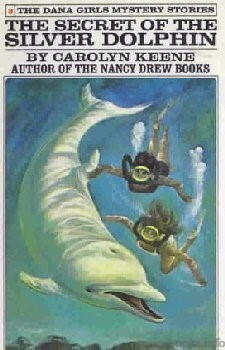 Pretty Judy Platt is desperately trying to find the silver dolphin mentioned in her dead brother's will. But no one knows what kind of dolphin to look for—a live mammal or a silver object. The only clue is Oliver Platt's signature, encircled by four stars to represent the constellation Delphinus—the dolphin. 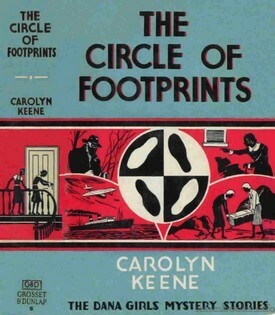 The Danas' sleuthing is hindered by a hostile fortuneteller and a hoarse-voiced man wanted by the police. 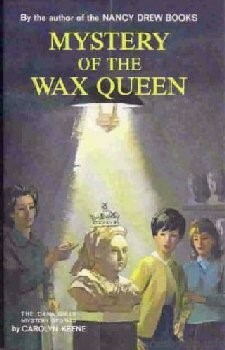 Louise and Jean Dana are thrilled when their uncle telephones them at Starhurst School and asks them to solve a very puzzling and fascinating mystery involving two Wax Queens, one of them alive! Time is of the essence—the puzzle must be solved during the girls' spring vacation. Their detective work takes the Danas to a quaint Greenwich Village shop in New York City. Here they meet and are baffled by a sculptress with extrasensory perception. Weird and spooky adventures confront Louise and Jean as they attempt to unravel the mystery of a valuable wax bust of Queen Victoria which suddenly and strangely appears in the sculptress' shop, then strangely disappears. 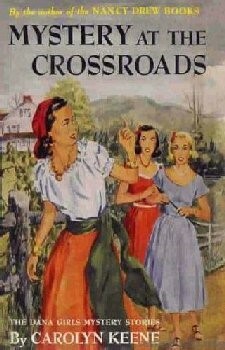 Two young women who frequently change disguises and a man suspected of operating a car winning racket try hard to scare Louise and Jean off the case. How the teenage sister sleuths, with the help of their friends Ken Scott and Chris Barton, find the solution to this tantalizing mystery is revealed in the breath-taking climax.. The Dana girls take time off from Starhurst School to accompany their Portuguese-American friend Isabel Sarmento and her father to Lisbon, Portugal. Senhor Sarmento has enlisted the assistance of the teen-age sister detectives in solving the baffling thefts of cork products from his Lisbon warehouse. But even before the ocean liner the Balaska leaves New York Harbor, Jean and Louise find themselves involved in a mystery on shipboard. What is the secret of the minstrel's magic music? 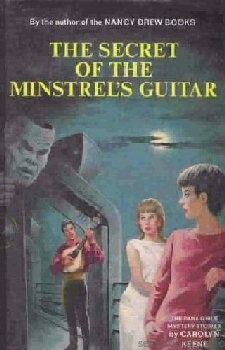 Why is a thief so eager to get hold of the handsome young man's guitar? Is the dangerous schemer somehow connected with the warehouse thefts? Jean and Louise successfully combine sightseeing in beautiful, romantic Portugal with outwitting a tribe of sinister gypsies as they unravel this seemingly unsolvable double mystery. With their Starhurst School friends, Jean and Louise Dana spend spring vacation at Horizon, located on the Atlantic coast. The seaside resort town is being restored to its former Victorian-era character. But the restoration project is plagued by thievery and sabotage. 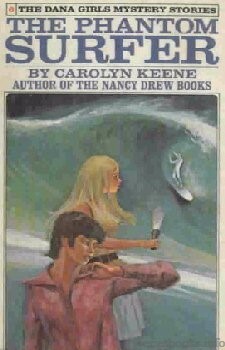 The Danas and their favorite dates, Chris Barton and Ken Scott, are plunged into the thick of the mystery when they witness a lumber theft, discover that signals are being sent from an abandoned lighthouse, and see the nocturnal surfer who time after time mysteriously vanishes before reaching shore. 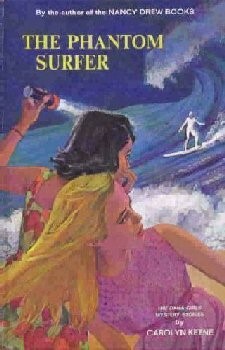 In between thrills and spills while learning to surf, the lively teenage detectives face many hazards in their attempts to trap the plotters responsible for the sabotaging of the restoration project. 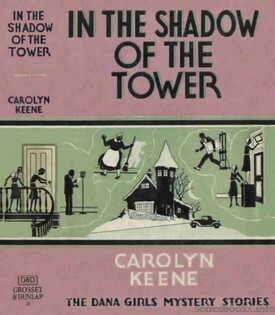 Published by Grosset & Dunlap - Foreign editions also exist. Issued both in dust jacket and picture cover format. There were 4 types of bindings used for the dust jacket versions: purple, blue, green and green tweed. 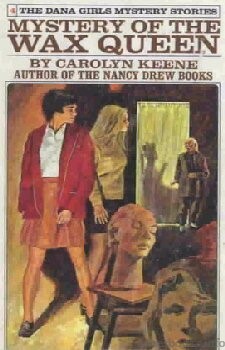 In 1972, the Dana Girls Mystery Stories were reissued again with slightly revised versions of volumes 17 and 19 through 30. The revised stories were renumbered with original 25-30 becoming new 1-6, original 20-24 becoming new 7-11, original 19 becoming new 12, and original 17 becoming new 13. The books had new cover art. Four additional new titles, volumes 14 through 17 in this set, were published from 1976 to 1979. The series went out of print in 1979. Published by Grosset & Dunlap. 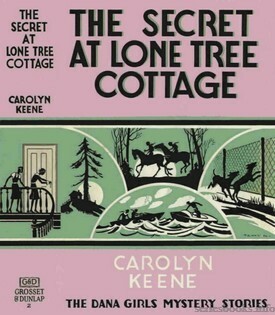 The revised series was issued only in picture cover format. Eight invitations mysteriously sent to Louise and Jean Dana for the same teenage pageant start these young detectives on a harrowing series of incidents. They must locate the fabulous stolen jeweled crown to be worn by the winning contestant. Their first clue leads to a hunt for the statue of a mythical bird. They find this prize only to lose it, but do not give up. One of the contestants is kidnapped. After receiving a strange message, Louise and Jean, with their friends Ken and Chris, embark on a dangerous rescue. Readers will hurry through this book to see if Louise and Jean succeed. A treasure in jewels and gold coins is hidden somewhere on the Beacon College campus! But where is it? And where is the codicil in which John Beacon, founder of the school, revealed its location? These are the questions the Danas are asked to resolve by their uncle, Phil Kenmore, president of Beacon, as the college approaches its centennial, the date on which it is to receive the fortune. During their investigation, Louise and Jean explore spooky caves and are almost drowned at the site of a Viking mishap from many centuries ago. But even before their hunt begins, the Danas are harassed by extortionists who claim to have the missing codicil. The girls' efforts are sabotaged over and over again by these unscrupulous enemies who will use any means—even the bombing of the school—to terrorize the Danas and hamper their search. Their resolve unshaken, the Danas follow every lead until, through a study of ancient Viking symbols and customs, they outwit their enemies in a breath-taking finale. Tammi Hodge, a fourteen year old orphan, is searching for the secret disclosed in a manuscript written by her grandfather. But the manuscript has been stolen, and a copy of it seems to have disappeared. Tammi asks the Danas to help her find the hidden duplicate. Louise and Jean take the case, but soon realize they are in a dangerous race with unknown enemies who are also hunting for the duplicate manuscript. The Danas encounter new threats to their lives at every turn as the thieves try to scare them off the Hodge property. Tammi is almost kidnapped, and a strange earthquake rocks the mountaintop home. The Danas' discovery of a hidden tunnel containing a strange gray powder is followed by an even more exciting find. But their jubilation ends when they realize they are trapped in the tunnel. Readers will thrill at the Danas' rescue, their defeat of cunning adversaries, and a fantastic revelation that goes back to prehistoric times. Louise and Jean's Halloween party is interrupted by the arrival of an uninvited witch who claims to be the keeper of the storm petrel. The witch's departure is followed by a mysterious fire in a coat closet, which breaks up the party and starts the Danas on a strange and worrisome case. Was the witch's arrival an omen that bad luck would come to them? Danger follows as the Danas meet the "petrel gang," a group of international lawbreakers. To make matters worse, their Uncle Ned, captain of the ocean liner Balaska, is reported to be seriously ill and responsible for injuries to his passengers during a terrific hurricane. Louise and Jean fly to New York, distraught by news of their uncle's plight. They are confronted with surprising and unexpected news as they uncover an invaluable clue. With great courage and superior sleuthing skills, they unravel a puzzling mystery of contraband cargo at the waterfront. 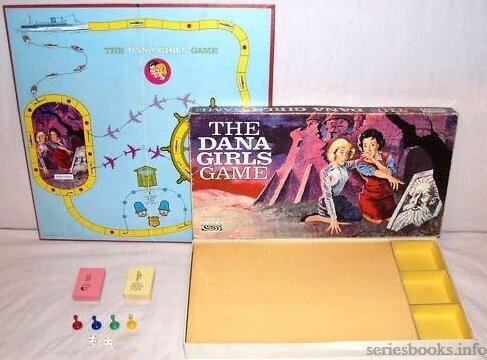 Parker Brothers produced a Dana Girls Game in 1965.
in a limited area and did not go into full scale production.